Don't you just love books that lead to reading more books? What about books that actually change your view on life? Have you read some of these types of books? 100 Must-Read Life-Changing Books is a guide of titles widely ranging from fiction, non-fiction, memoirs, self-help, history and more. There are well-known authors highlighted as well as not-so-popular writers. I admit if it weren't for this book, I would not have added some titles to my TBR pile. I was also pleased to find that I already read some of these life-changing books. So I highly recommend this guide for serious readers looking to broaden their personal library and open to discovering a life-changing book. Thank you, Nick Rennison, for putting together such a handy guide. My Series Sunday pick is B is for Burglar, the 2nd book in the Kinsey Millhone alphabet mystery series by Sue Grafton. Private Investigator Kinsey Millhone should have followed her instincts. Instead she took on a case to locate Beverly Danziger's sister Elaine Boldt. Beverly claims she needs Elaine's signature on an inheritance document. The more Kinsey digs into the disappearance, the more serious it gets with a brutal murder, a burglary, a vandalism, a deadly fire and a missing cat. Kinsey tries to figure out if it's all related. Although the series began in 1982, the story line, setting and characters seem up to date. If you like murder mysteries, there is plenty of it in B is for Burglar. My only gripe was the too descriptive scenes as mentioned in my review of the first book in the series A is for Alibi. But it was definitely enough to keep me reading and to order the third book. I hope the main character continues to develop, get involved in more mysteries and maintain her ordinary down-to-earth personality. I like how Sue Grafton keeps Kinsey's personal life to a minimum so it won't distract readers attention from the mystery at hand. But there is just enough personal details to still relate to the main character. Well done! "Funeral crashing is a little weird, I suppose, for someone my age." There are lots of lit tidbits to report since my holiday break. So grab your favorite hot beverage, sip and read. By now, all of you have seen the commercial where the little kid chose the iPad over a physical book. **clutches my pearls** Well according to a report from Sesame Workshop, kids prefer eBooks over print books. I'm sure other centers will conduct similar research studies. Something tells me that print books will be a thing of the past for kids in the next couple generations. In other kiddie news, McDonald's plans to include Mudpuddle Farms book vouchers in Happy Meals around the UK. Lil Wayne will release his prison memoir, Gone Till November, in November 2012. It will be published by Grand Central Publishing. Two parents recently challenged The Plymouth-Canton Community Schools AP English class assignment to read Beloved by Toni Morrison. A decision whether to remove the book from this particular Michigan school's AP English program will be determined soon. Apple released a new free app called iBooks Author that allows writers to make eBooks and publish to the iBookstore. It is available in the Mac App Store now. I plan to play around with it and will post a review later. A very popular series is coming back to television. Guess who? I will reveal it in a few days. Allow me to re-introduce myself. 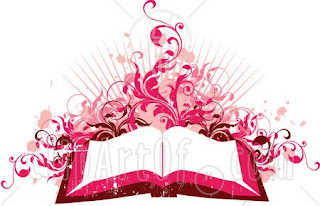 I am Literary Marie: reader, writer, reviewer, copyeditor and eMag subscriber. Seriously, I am addicted to reading eMagazines on my NOOKcolor. I subscribe to seven so far. Which magazines do you subscribe to? Today is my 2nd Blogoversary! I'd like to thank all of my bookhearts, followers, subscribers, family, friends and fellow bloggers for your support. To show my appreciation, I am giving away a $10 eGift card to your preferred book seller (Amazon.com or Barnes & Noble). Just leave a congratulatory comment to enter the giveaway. The giveaway ends on January 31, 2012, at 1:25 p.m. Thanks and cheers to many more years together. I ♥ you. And you. And yes, even you!